There are seven legislative assembly constituency in Ghazipur district for the 2017 Assembly elections. They are 375 Ghazipur, 373 Jakhanian, 376 Jangipur, 378 Mohammadabad, 374 Saidpur, 377 Zahoorabad, 379 Zamania. When Uttar Pradesh assembly election 2017 is getting ready to electios new Assembly, Ghazipur is not anywhere behind in the election heat. 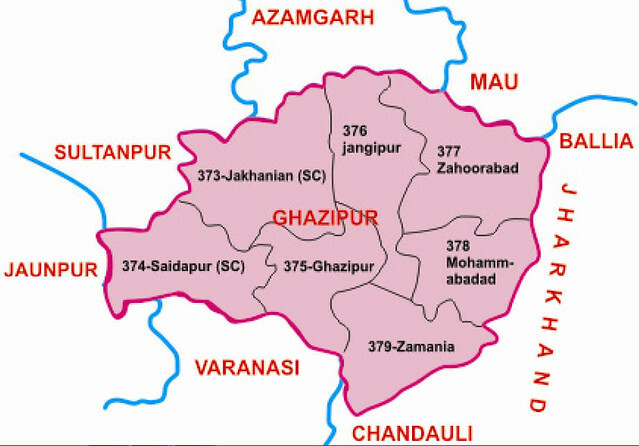 Ghazipur District (Hindi: ग़ाज़ीपुर ज़िला, Urdu: غازیپور ضلع Ghāzīpur Zilā) is a district of Uttar Pradesh state in northern India. The city of Ghazipur is the district headquarters. The district is part of Varanasi Division. The region of Ghazipur is famous mainly for the production of its unique rose scented Spray called Gulab Jal, and for the tomb of famous Viceroy of British India, Lord Cornwallis, who died here. His tomb is situated in Western part of City, and is conserved by Archaeological Survey of India.